The year was 2009  a boardroom full of BMW boffins were racking their sensibilities  does it make sense to lend the M-badges to something with an all-wheel drive, and more importantly, something with the BMW X-prefix? After all  'M' stood for Motorsport. The eventual verdict was: Why not? And it has been one of the M-divisions better judgments. 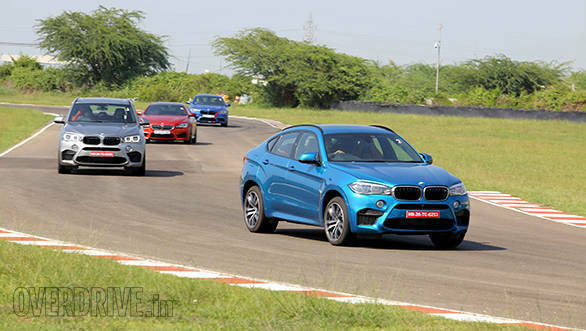 Now nearly 6 years later, we've got the second generation of the M-badged Sports Activity Vehicle  the X5M, and the Sports Activity Coupe  the X6M, with us on the sweltering, dry, coarse Madras Motor Race Track, and I have just one immediate thought running through my head  I hope they have enough set of tyres to last through my magazine and television shoot. The X5M and the X6M are inseparable from the front, and it's only until you get to the three-quarters that you can tell the 5's typical SUV form from the 6's distinctive Coupe form. The very large air intakes up-front and flaps are absolutely functional considering the size of the radiator (which is a story in itself and I'll get to that) and so are the side gills that reduce turbulence around the front wheels. The kidney grille with the twin slats is typical to the M versions. At the back the two are at their most distinctive with the X6's Coupe form even getting its own spoiler. Quad pipes and M-badges all-round, oh and those massive 21-inch M light alloys, round up what separates these special versions from the standard X5 and X6. In fact, even when you get inside the cars you won't realize which one you're driving, till you notice your rear view mirror and the rear visibility in the X5M or lack thereof in the X6M. Both cars get the expected assortment of features and luxury bits, but let the magazine story give you those details. Right now, I'm just excited to tell you about whether, despite all of BMW's efforts, are the X5M and the X6M really meant for track days. 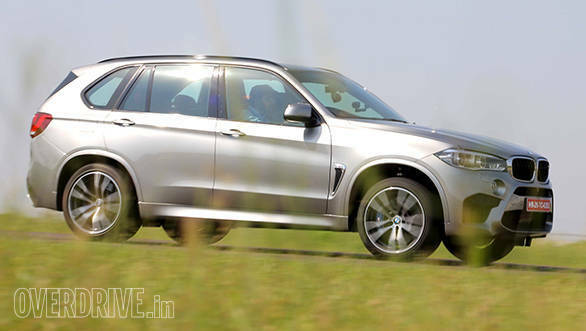 The engine is the same 4.4-litre twin-scroll twin-turbo unit that Shumi drove in the current generation of the M5 and the M6, but of course, it has to make more power to match the bulk of these brutes. So the force-induced engine now makes 583PS of max power available between 6000 to 6500rpm, which is an increase of 4 per cent, and 750Nm of max torque available from as low as 2200rpm, which is a bump up by 10 per cent. Meanwhile, BMW claims the engine is 20 per cent more efficient and reduces emissions by a similar percentage, but umm, we're not going there, are we? Bit touchy. To you and me, all this means a 0-100kmph dash for a 2.3 tonne mammoth in a claimed 4.2 seconds  the only thing that can touch it is a Porsche Cayenne Turbo (a comparo soon perhaps). The best transmission to handle that kind of torque, according to BMW, was the conventional torque convertor of the 8-speed kind, and interestingly not the M-dual clutch. Now, on the race track, you can establish that the 8-speed M Steptronic isn't perhaps as quick as the twin-clutch, but the difference in the real world is barely palpable. The dark horse of the drivetrain is however the cooling system which has a huge role to play considering the duality of function of the SUVs, and the forces at play considering it's proportions. The M-engine is designed to operate optimally at race track performance induced temperatures, but it also needs to run in stop-and-go traffic where there is no air cooling. So the X5M and X6M use a combinations of high temperature and low temperature radiators, which also handle the cooling of the turbocharger, transmission oil and act as intercoolers. The oil sump has been designed alongside a suction snorkel geometry to counter the cornering and lateral g-forces so that cooling isn't hindered at any point. 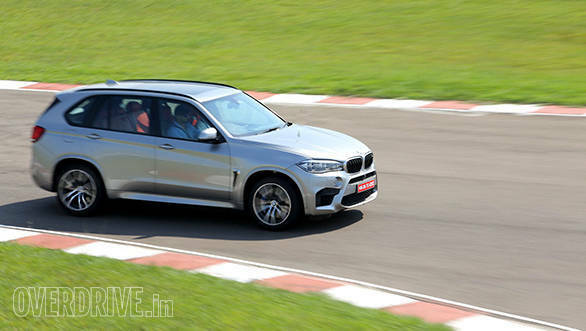 The X5M and X6M get BMW's brilliant X-Drive All-Wheel Drive system, which can transmit as much as 100 per cent of the power and torque to the front or rear axles, as per the demand, through a multi-plate clutch. But here's where I read the brochure and caught what I thought was the German sense of humor. BMW lets you switch the Dynamic Traction Control off completely, but they also have an intermediate mode called the M Dynamic Mode or MDM, which they say allows 'controlled drifting' in the X5M and X6M and (I swear I'm not making this up) "nudge the car into power oversteer (i.e. a drift) using the accelerator". Well, OK then  you asked for it. After driving other M cars you wouldn't call the X5M and the X6M Drift Kings, but to my utter bewilderment, you actually could get these cars sideways. Again, not in the way the other M cars do, but sideways nonetheless. Sure, the all-wheel drive system didn't agree with the demands and promptly sent more power to the front wheels to police our naughty intentions, but you could manage a few nice slides. BMW have tuned the front wishbones, specifically increased the upper wishbone's camber and optimized the steering axis. They've dropped the ride height by 10mm and all of this is intended to improve its cornering ability. At the risk of sounding ludicrous, the X5M and the X6M felt more at home than even the M5 and M6 that I drove earlier which I think is down to the X-Drive system. Despite sitting higher, the body roll is negligible for its size  once again only matched by the Porsche. ). The steering response is sharp and direct, but that's something I had no doubt to begin with  it's what BMWs do well. You can choose the servo input and hence the steering weight between its Comfort, Sport and Sport+ steering settings. My first kick down on the brakes on the X-Ms was a bit of an eye opener, as the brakes and not the throttle, are the telling difference between driving the X-Ms and other M-sports sedans. When you compare them, you're likely to feel shortchanged because the M-sedans stop far more easily than the X-Ms, this despite the increase of surface of brake liners on the front brakes by as much as 50 per cent. You can only imagine how much worse the predecessors felt. But then again, you have to remind yourself of the sheer momentum of a 2.3 tonne mass  that's when things fall into perspective.